Pride Toronto members have placed an outright ban on police participating in this year's parade. The decision was taken at Tuesday night's AGM, following a list of demands put forward by Black Lives Matter (BLM). BLM members stopped last year's parade in July, when they staged a sit down protest, which ended when Pride Toronto executive director Mathieu Chantelois signed a document agreeing to the list of demands. Banning police from the annual celebrations was not part of that deal however, and was unexpectedly added to the meeting’s agenda before being voted through, causing divisions on whether or not a total ban should be enacted. These differences played out on Twitter. The majority of members voted in favor of the full list of demands, included not only the police ban, but the promise to hire more people from vulnerable communities and to provide more funding for Pride events aimed at minority groups. “This is what we’ve been wanting to see. This was the possibility for years,” BLM activist Ravyn Wngz told Citynews. "It's a big deal when you have a chance to actually have some forward movement. 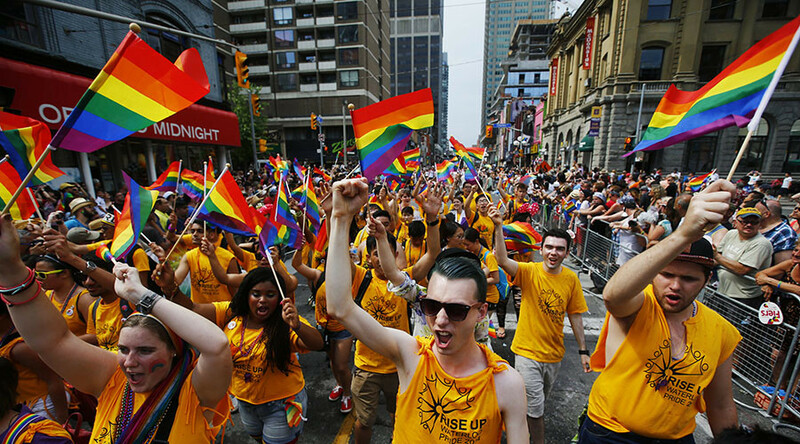 And we're going to push Pride Toronto to make sure those demands are actually met." "It was exciting to see so many hands go up, when you've been silenced for the last twenty years," he added. "What happened tonight was a vote that simply reaffirmed the commitment and the path that the organization was on," he said. However, not everyone present voted in favor of the ban. “I’m no friend of the police but I believe we do not ban anyone from Pride,” James Dubro said.